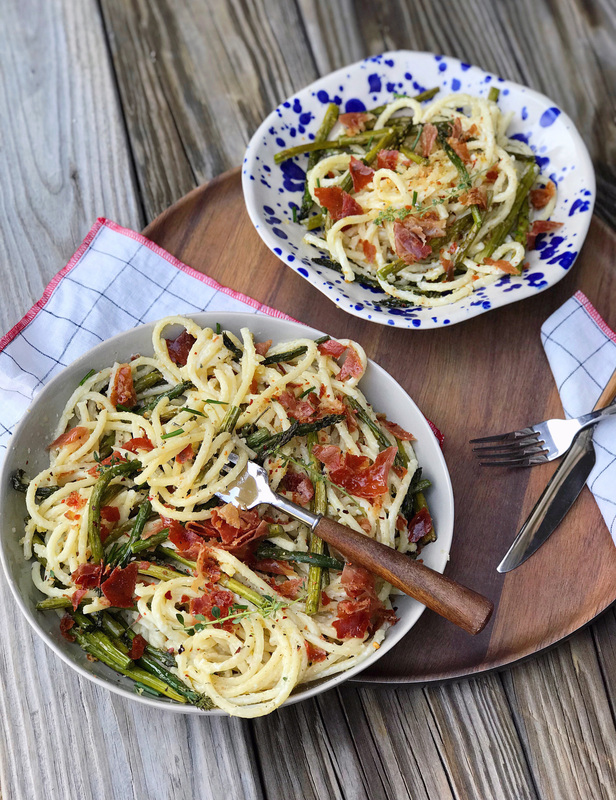 Crispy Prosciutto and Asparagus Bucatini. Bring a pot of salted water to a boil and cook bucatini as directed to al dente; reserve about ½ cup of pasta water before draining. While pasta is cooking, trim asparagus into 2-3” pieces and toss with olive oil, salt and pepper. Transfer to a large rimmed baking sheet and spread them out so they cover ½ the pan. On the other half of the pan, arrange prosciutto slice. 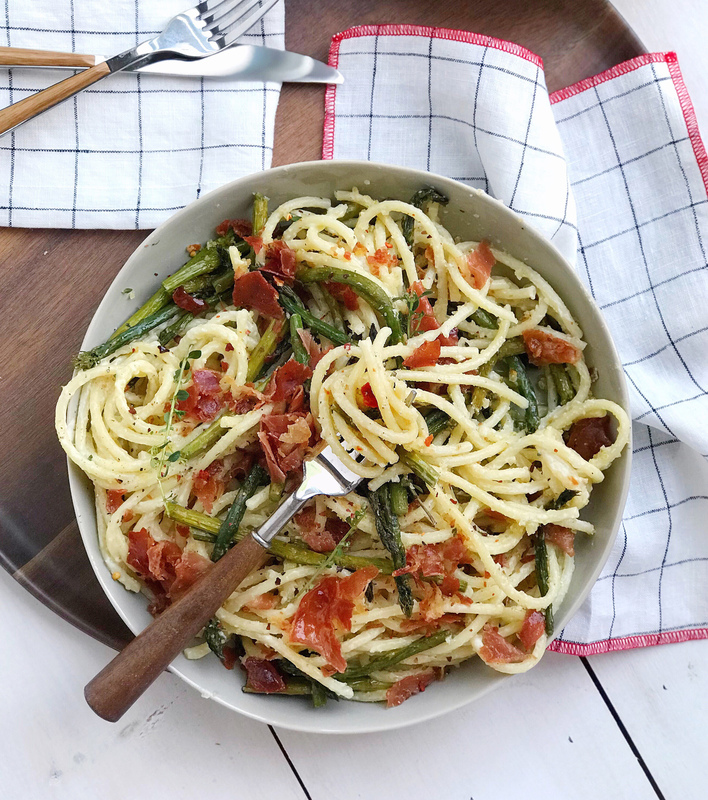 Bake the asparagus and prosciutto for 15-20 minutes (allow longer time for thicker asparagus). During the last 2 minutes of cooking, turn the oven up to broil and toss panko breadcrumbs on top of the asparagus. Broil for just 1-2 minutes, until breadcrumbs being to turn a golden brown. Remove from oven and transfer prosciutto to a cutting board to be chopped up. To make the sauce, melt butter in a pan over medium heat and sauté the minced garlic. Add in the white wine and whisk together, bringing to a simmer. Reduce heat to low and stir in the cream, parmesan cheese, and fresh thyme. As the sauce starts to thicken, stir in the reserved pasta water – between ⅓ to ½ cup, and then use a pair of tongs to add the bucatini to the pan to coat the pasta in sauce. Fold in the asparagus, remaining bread crumb bits from the pan, and chopped crispy prosciutto. Season to taste with additional salt and pepper, and top with red pepper flakes and additional thyme sprigs before serving. The Download – 08.16.18 Simple Summer Sangria. 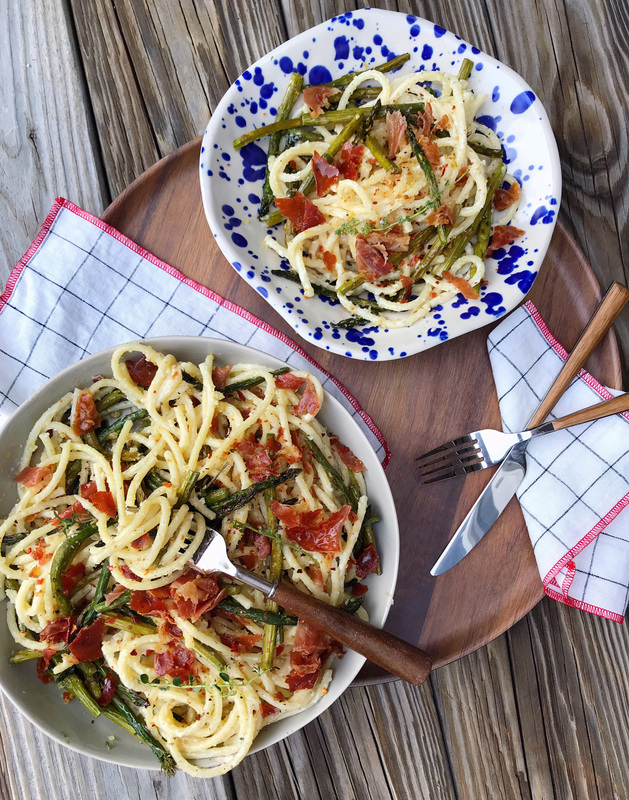 4 Responses to "Crispy Prosciutto and Asparagus Bucatini." This looks insane!!! I can’t wait to make it on my carb cheat day! You are so right—all the greatest ingredients. I’ll look for the pasta in the international aisle at my grocery, but if I can’t find it, can you recommend something else? Aw thank you! And yes you can replace bucatini with any kind of long pasta — a thick spaghetti or linguine would work! This looks and sounds amazing, Kate! Carbs are my love language!